In a highly anticipated return to New York City, leading Middle Eastern fashion label, Soucha Haute Couture, will present its latest collection of inspired designs at Couture Fashion Week on Friday 13 February 2009 at the world-famous Waldorf-Astoria Hotel. Cairo-based Soucha Fashion is considered one of the leading fashion trendsetters in the region. A native of Tunisia, Soucha is a talented young fashion artist and graduate of the famed Academia Della Moda in Florence, Italy. 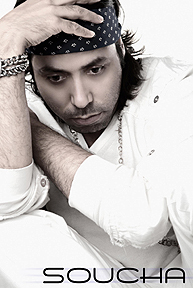 After his schooling, Soucha worked with top Italian fashion houses and eventually settled in Cairo, finding his niche dressing the stars and celebrities of the Egyptian and Arab entertainment world with his unique fashion creations. In 1997 he launched his own brand and continues to lead and chair the thriving and developing business. Soucha Fashion today has 20 employees, excels in impeccable couture design and manufacturing, and operates two exclusive Cairo boutiques in the Grand Hyatt Galleria and the Nile City Mall Twin Towers. Catering to the A and B class of the Egyptian and Arab consumer, Soucha Fashion continues to expand in the region with representation and sales in major markets such as Saudi Arabia, Kuwait and Qatar. The company has plans for further retail growth as well as development into casual wear and accessories. Soucha regularly shows his exquisite evening and bridal creations at top fashion events and is the recipient of numerous awards including Face of Africa - Best Designer. He made his USA debut in September 2008 at Couture Fashion Week in New York City to enthusiastic reviews. "We are really looking forward to Soucha's fashion show this season," says event producer Andres Aquino. "He has a flair for the dramatic and pays great attention to every detail of his presentation - from the beautiful fashions to the glamorous accessories and lavish hair and makeup. Soucha's fashion shows are a visual treat."